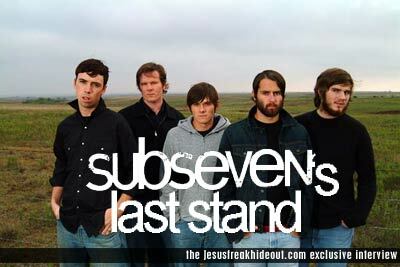 Jesusfreakhideout.com (John DiBiase): What's the story behind the name Subseven? Caleb Wilkerson: Subseven is two words. Basically, "sub" is short for submitted and "seven" is God's number, and the name just means submitted to God. (John: That's cool.) Yeah, that's how the name started out. We just wanted a name that would reflect that. JFH (John): How'd you get started as a band? Jesusfreakhideout.com (John): Although not a lot of time has passed between the EP and the recording of Free to Conquer, there's a noticeable change in the sound, especially the vocals, too. What sparked this change? Was it working with different people? Jake: ...And songs that were already there before I was in the band. As far as the new stuff, we were able to bring our assets up to the table more so. Plus we worked with a different producer than with the producer with the EP. JFH (John): Did you try developing a different sound in your voice at all? Wesley: Not really. I think if there's any change, it's not really on purpose, it's just a creative change. Just trying to be different than what you were last time. You don't wanna do the same monotonous thing. I mean, for us, we listen to different music. Every year our whole collection of music changes. I think you just kind of play what you listen to. JFH (John): Who was the producer you worked with on Free to Conquer? Wesley: Sam Shifley and Nathan Danztler. This type of record really gives it away. They worked on Mortal Treason, the new Kids in the Way record too. (John: You think you really pushed your sound?) Yeah definitely. JFH (John): What kind of music are you guys into? What bands are you into right now? Reed Corbin: We got a lot. New Order, (Red Hot) Chili Peppers, Deftones, The Cure, the blues, Violet Burning. Jake: We all have a pretty wide variety of music. It's cool because Caleb throws in his blues and we all throw in our 80's pop and whatever we like, and by the time we all throw in our stuff, it's pretty cool. (John: Is that what influences your style?) Yeah totally. You are what you eat. Caleb: That's why Free to Conquer is so everywhere. There's not one set style. "Game of Love" is totally different than "Free to Conquer," "Vampire," and "Family Secrets." We don't like to stay in one place. We just kind of flow with it. JFH (John): How'd you go in to the writing process for Free to Conquer? Lyrically, the songwriting, was it different than before? Jake: A lot of the lyrics revolve around the aspect of prosperity and how prosperity isn't just a financial thing. It is a financial thing, but not just. It's also a mental and health guide. Emotional too. God wants you blessed in all those areas and stuff. I think for the past year, really unconsciously we wrote a full album of just songs that talked about that same message. They're not all repetitive lyrically, but they have the same message and that's exciting. I think that was exciting for us. When it all came down to it, we did actually have a good solid album that had a message that fit together and it wasn't all over the place. This song's not about a girl, this song's not about this, but it was very organized. It was actually by accident so we gotta give God credit for that. JFH (Amy): What's the nature of your writing style. Do you write together? Do you do just all one song? Wesley: Usually I'll just write a song or bring pieces in it and then come back and throw down lyrics. Jake: Caleb has some good lyrics too. He's quite a poet, so he's got good stuff too. JFH (Amy): Do you get any outside people that you get influence from or that write with you that aren't actually in the band? Jake: Actually we have lots of influences and stuff that no one else really has. Caleb: It's usually us five that get in a barn and crank it up in the barn. JFH (John): You guys in the Fall toured with Project 86, Falling Up and Pillar. What's the hardest thing about touring for you guys? Any trials that come out of that? Being so closely confined with each other all the time, and trying to stay focused and having the energy to keep going? Jake: Been away from home like forever it seems. Wes and I are married. (John: Together?) *laughter* (Amy: He's so sarcastic...) (John: I'm only kidding.) But yeah we're married. (Amy: Do any of you guys have kids yet?) We're actually leaving today because I have a kid about to be born. (Amy: Are you cutting [GMA] short?) We're gonna jump out of here as soon as we can. 5:30 or 6. It's a long drive home. It's our first little boy. We have the proof. They showed us an ultrasound. It is a boy. Caleb: Love. Focus. A lot of times it's easy to focus on stuff that's not going good. Things that people are, like your record label doesn't do something. Stuff that just makes you mad. Booking or whatever. Not that they're all mean and like that. It's easy to focus on, as far as the band goes, stuff that you're not happy with, as opposed to all the other cool stuff that's happening. All the great stuff that's happened already. So that brings focus and trust. Jake: Along that line too, stuff that comes up, you have to kind of sit back and remember that God loves you, and God has a purpose for this ministry, for this band. And when those things come up against you and try to distract you or take your hope away from you, you have to remember that God loves us and has a plan for this band that is gonna be fulfilled. Wesley: It seems like the further He takes us, we realize how important it is to share that love and just... You can never be focused enough, because you think you are. A year ago, I thought I was focused. But if I judge my focus now to a year ago, I'm way more focused now than then. And just continuing to grow and continue to grow in love and being focused at the shows to show that. JFH (John): What's your central goal as a band? Jake: To play everywhere. *laughter* To play for anybody, anywhere, anytime, anyplace. We don't wanna be ruled down to one thing. Like our tour's coming up, we're touring with Disciple. And later we have a tour with Project 86 and Spoken. Then we go on the Warped Tour, it's very cool. It's a mix of Christian and mainstream stuff. So that's exciting. (Amy: Who's on the Warped Tour?) Christian bands - us, Underoath, Mae and Relient K. And everybody else is like Thrice, The Used, Blink 182. (Amy: Are you intimidated?) I think it's just anxiousness. We're ready to be out there. We're ready to play it. Just see what it's like and make friends with these bands and build relationships and just be ourselves. At the same time, it's an open field for ministry. It's not a church thing. It's total evangelism. Clint: You wanna tell them about the MTV thing? Jake: We had an opportunity to have our video on MTV, Fuse and stuff like that. We just shot a pilot with some guys from Fuse TV two days ago. We played in New Jersey, which was cool. When we pray, we pray that God would bless us with things that we ask for and things that we never even thought about before. And another thing, too, is we wanna tour Europe really bad. We had these interviews with these guys from the Netherlands and we told one of the guys and he gave us a quiz on the Netherlands, and we flunked it. (Amy: How humbling is that.) We're already getting our passports ready to go. We're just preparing ourselves to let God just take us wherever. We don't want any limits, any boundaries. Clint: I know we definitely believe that no matter where we go or what we do we have God's favor upon us. Doors open and people... Things happen and it's God's favor. And we just walk in that.